Here are photos of an extremely wide scar at 3 months and 1 year post-op. We harvested several regions of the body and transplanted the donor scar with a low density. In this case, we used thigh hair, upper back (shoulder) hair, lower leg hair, and thigh hair in separate regions of the scar. Our goal was to assess different regions to evaluate a disparity in yield. One year later, we noted that yields appeared good. The areas of higher density produced the best result coverage. It is important to note that our highest density did not exceed 36 per sq. cm. All areas appeared to have a good yield, but coverage was best with about 20 to 30 per sq cm. A grid system similar to that proposed by Jimenez and DevRoye helps to insure a consistent density. All areas grew well, but coverage was best with the leg hair and chest hair, perhaps because we placed these areas with a more consistent and higher density. The tattoo appeared to fade slightly with grafting. Skin tone took on a more pinkish color with the addition of normal dermal tissue. One can think of this as a delusional effect on scar tissue. One problem is that the body hair is finer and thus produces less coverage. It is proposed that far greater quantity of body hair will be required to produce coverage than scalp hair. 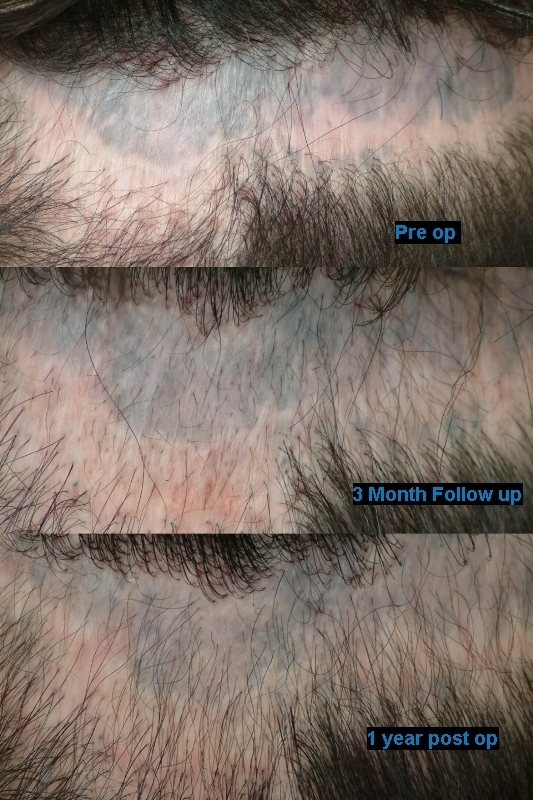 It is difficult to determine how much additional body hair might be required, but one might easily estimate that 3 or 4 times as many body hair grafts will be required to produce the same effect as lesser quantity scalp hair grafts. The above image is no longer hosted by the server, the image is now restored as follow from the backup disk. How wide is his scar? » How wide is his scar? This unsightly scar is about an inch and a half wide.